Korean telecommunications giant SK Telecom said Thursday that it had a successful trial run of new sub-ocean voice-over LTE wireless service, or HD Voice service, for the first time in the nation’s history. A successful test run of the service took place aboard the Seogwipo Submarine on Thursday, about 40 meters below sea level off the coast of Jeju Island, according to the company. The vessel has been providing outings for tourists since the late 1980s. SK Telecom said it used an LTE transmitter and antenna attached to a flotation device, then connected it via cable to the submarine in order to connect it with Seogwipo Port and provide the service aboard the ocean craft. Also known as VoLTE, the service refers to a high-speed network that transmits data and allows users to place phone and even high-definition video calls at unprecedented speeds. Smartphone users can also access mobile apps and download video through the network. The number of fourth-generation long-term evolution (LTE) network users in South Korea hit the 8.4 million mark with the figure expected to nearly double by year’s end, industry sources said Sunday. 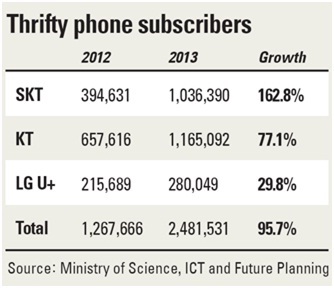 Sources said SK Telecom Co., South Korea’s largest mobile carrier, reported its 4 millionth subscriber on Friday, 44 days after it said user numbers reached 3 million. KT Corp., the country’s No. 2 mobile communication service provider, said it provided LTE service to 1.4 million users as of early last week, with the number growing steadily on a daily basis. 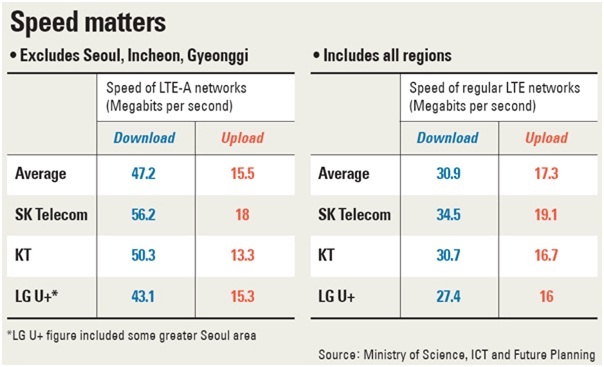 LG Uplus Corp., South Korea’s smallest mobile carrier, said that people using its fourth-generation network should break the 3 million mark in a few days, as more and more people opt for the super-fast communications network that allows people to see movies with no lag time and download full-length movies in seconds.